That was written in the last letter to his family by Father Anthony Conway, chaplain in the U.S. Marines and a priest of Philadelphia, ordained May 22, 1937, and who died on a Guam beach July 23, 1944. 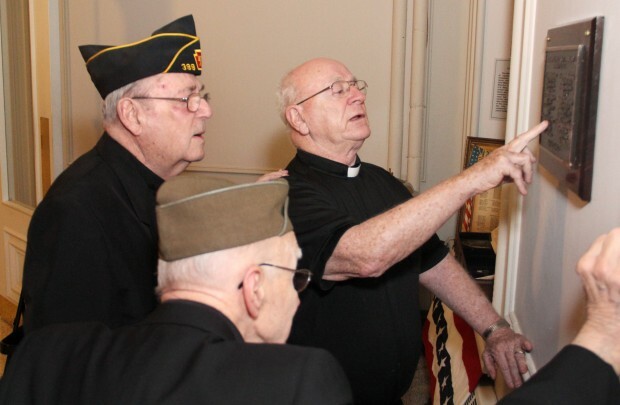 Father Conway was one of the six archdiocesan priests who died while in service during World War II and were honored during ceremonies at St. Charles Borromeo Seminary on Dec. 7, the 71st anniversary of the bombing of Pearl Harbor. The others were U.S. Army Chaplain Peter Bonner, ordained May 30, 1931 and died in Normandy July 24, 1944; U.S. Army Chaplain John Hughes, ordained June 10, 1933, died in Italy Nov. 4, 1943; U.S. Army Chaplain William Irwin, ordained May 30, 1931, died in England Aug. 8, 1943; U.s. Navy Chaplain John McGarrity, ordained June 10, 1933, died in the sinking of the USS Langley, Feb. 27, 1942, and Father Dominic Gillespie, ordained May 22, 1937 and died in Nome, Alaska, March 29, 1944. In all there are 70 Catholic chaplains listed on a monument in Arlington National Cemetery for having given their lives during World War II. That six should be from a single diocese is remarkable. More astonishing is that there were 78 Philadelphia diocesan priests in service during that period, which places their mortality rate almost three times as high as the military service as a whole. Before evening vespers on the Pearl Harbor anniversary Bishop Senior formally blessed a plaque adjacent to the seminary’s Immaculate Conception Chapel that memorializes the six chaplains. Joining with the seminary community for the dedication were several retired priests who also served their country at various times. Father Sidney Burgoyne was an infantry soldier who went over to Europe just before the Battle of the Bulge in 1944 and saw service in France, Germany and Austria. Msgr. Francis Menna saw pre-seminary service with the 2nd Infantry Division during the Korean Conflict. Father Robert Breen was formally not in the service during the war, but that really is a technicality. Msgr. David Benz has the distinction of military service both as a layman and a priest. “I was enlisted for the Vietnam conflict,” he said. “After that God hit me on the head and I entered the seminary.” Not long after ordination he went back as a chaplain with service in various parts of the world. 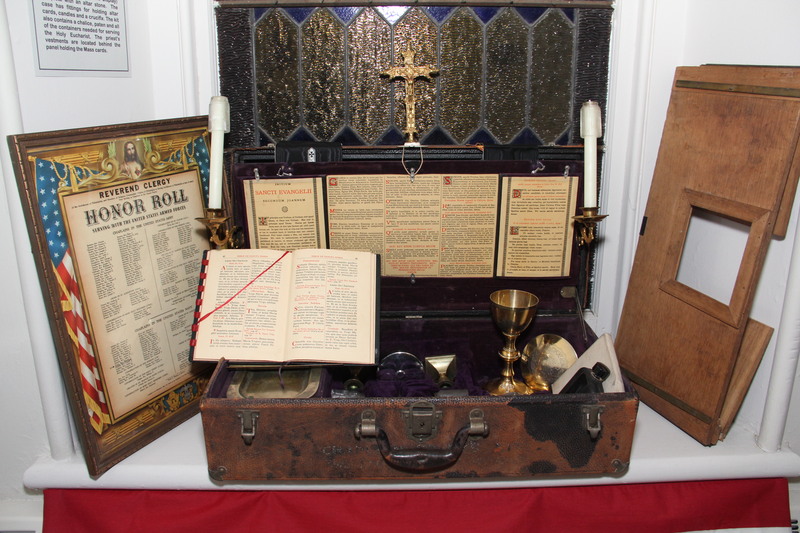 A service chaplain’s Mass kit circa World War II. I just came across this article from Dec. 10, 2012 honoring WWII chaplains who died serving their country. My uncle John was one of these men. Father John Patrick Hughes was my father’s brother. Although I never met him, I looked at a picture of him dressed in military uniform which my Dad kept on his bedroom dresser. Growing up , I always included Uncle John in my prayers and continue to pray for him . I truly wish I had known him. During a mass in December at my parish, Mary Mother of the Redeemer I thought I heard an invocation to pray for Fr. John Hughes during the general interceptions. First I thought I was hearing incorrectly, then I thought it was for Archbishop Hughes. Now I know that we were praying for my Uncle John. I am so happy to know that he is being remembered for serving God and country.